In the Bandwidth Graphs, you can view the bandwidth usage of your company over the last month. 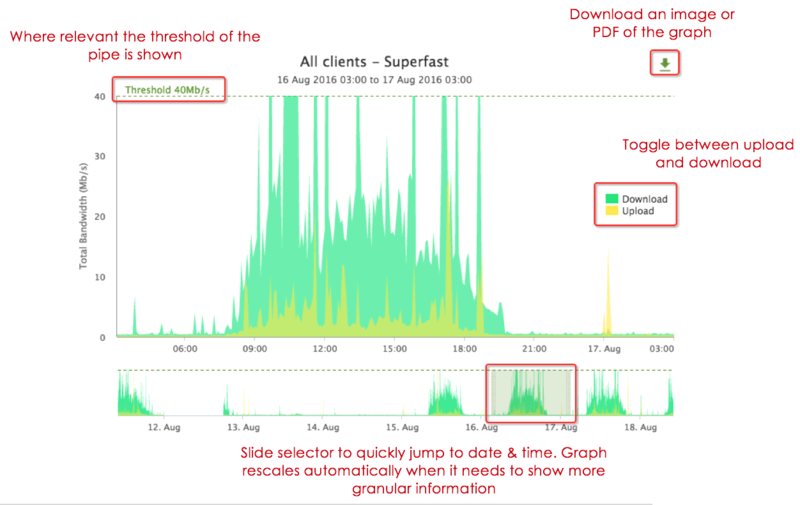 You can see where peaks occur, assess whether you are reaching the threshold of your purchased services, and view protocol data to monitor which sites your users are accessing. You can access your Bandwidth Graphs from the main navigation of Connect. By default, you will see today's graph. The draggable bar at the bottom of the graph allows you to select a specific time period. The graph will scale automatically to show more detail when you zoom into a shorter time period. You can also jump to a preselected time period using the 'Time' options to the right of the graph. You can download the graph, and switch between download and upload views. If you are on a dedicated pipe, the threshold will be visible on the graph. The pipe which your company is using is displayed in the heading of the graph. Select Applications to see how the data has been used by the users within your company within the selected time period. Bandwidth Manager lets you see a breakdown of bandwidth by IP address with the new IP Breakdown graphs. Choose a client in the dropdown menu then click the ‘IP Breakdown’ button. You will see a bar graph that will breakdown the bandwidth usage by IP. You can now identify which IP address is using most of the bandwidth. If you would like to discover how much an application is being used by IP then you are in luck. 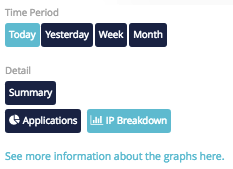 Our application pie chart now lets you dig deeper and view a breakdown of an application by IP address. Click the desired application on the pie chart and you will be taken to a second IP breakdown pie chart. Why is no data appearing? There may be no data for a few reasons. You may not have purchased any internet services, or you may not have consumed any bandwidth within the selected time period. If you believe data should be appearing, contact the essensys team. Why does the Y axis on my graph change? The Y axis on each graph will change depending on the threshold of the pipe. When viewing a Shared or Dedicated pipe, the Y axis will be set to the threshold of the pipe. When viewing a Client's graph, only those on a Dedicated pipe will display a threshold. If the Client is on a Shared pipe, the threshold will not be visible, and the Y axis will be limited to sit just above the highest data point within the selected time range. What is displayed in Applications? The Applications view shows the Protocols, i.e. which applications or servers have been in use on your network. The graph displays the combined upload and download from these applications. Different protocols are used when data in transferred between endpoints. For example, HTTP (Hypertext Transfer Protocol) is the protocol used for normal web browsing. Some protocols are only used for specific things, which is why commonly used sites such as Youtube, or Facebook, or Office 365, can be identified and displayed.